CATAMARAN DVDS SHOW YOU WHAT IT'S LIKE TO CRUISE IN A CATAMARAN. CAPTAIN DAVE. Dreams are dangerous things. Sometimes they take over your life. I spent the past thirty years sailing on the ocean of my dreams. For most of those years, my feet were on dry land, but in my mind, I was sailing the seven seas. I've sailed around the world dozens of times in my mind with Joshua Slocum, Harry Pidgeon, and Bernard Moitessier at my side. I've survived the savage seas of the high southern latitudes with the crew of Tzu Hang as they were pitchpoled in the waters off Cape Horn. I've been with the Pardeys and the Hiscocks as they sailed on their voyages of discovery. I've deployed parachute sea anchors and trailed drogues hundreds of times in the storms of my mind. I've dropped my anchor in Paradise and snorkeled in enchanted atolls. I've even escaped from pirates - buccaneers of the mind who tried to steal my dreams. In my mind, I practiced sailing around the world for more than twenty years before I actually cast off my dock lines and set sail on my eleven year circumnavigation. So how did it feel to make my dreams come true? First, I would have to admit it was a bit scary to drop the dock lines and set sail. This was a voyage of exploration into our unknowns, and unknowns were in abundance. During the trip around the world, we often ran out of wind, sometimes we ran low on diesel fuel, but we never ran out of unknowns. I didn't know how much the trip was going to cost. Working for eleven years in Saudi Arabia paid for my boat and supplied me with enough freedom chips to weather any financial storms that came our way. I knew that the trip was going to cost a lot of money, especially with college coming up for my kids. Some days, I wondered if I could really afford to make the trip, but on most days, I KNEW THAT I COULDN'T AFFORD TO NOT MAKE THE TRIP. The currency of my youth was in short supply, and having an awesome adventure with my family was worth any price. And how do you count the richness of your life anyway? Dreams or dollars? Which will it be. I'll take my dreams any day. Second, I had never made an ocean passage before I started the voyage. I had only sailed my catamaran six times before I started out on the trip. I was unproven and my yacht was unproven. The biggest things I had going for me were that I had a positive attitude, a positive family, and I had already sailed around the world dozens of time in my mind. I quickly learned that sailing a catamaran isn't rocket science, and if we can do it, anyone can. A conservative amount of sail and a positive attitude will take a sailboat just about anywhere you want to go. Third, in my mind, I was afraid of pirates, tsunamis, and hurricanes. As it turned out, we never met a pirate, we survived one global tsunami in Thailand totally unscathed, and there was nary a hurricane that threatened our eleven year voyage. The worst thing that happened on the entire circumnavigation was a car accident in New Zealand that broke two legs, fractured five ribs, and punctured one lung. It took me out of commission for nearly a year, but it didn't stop the voyage of Exit Only. After the fractures healed and I learned to walk again, we set sail for Fiji and continued sailing for nine more years before we completed our trip around the world. Dreams do come true, and making them happen is within the capability of ordinary folks who have extraordinary dreams. A positive attitude and unstoppable persistence allows anyone to sail on the ocean of their dreams. All they have to do is do it. All you can do, is all you can do, but all you can do is enough. It's a lot of work to live your dreams, but that doesn't matter, because when you live your dreams, your life is worth living. Your life keeps getting better, and before long you realize that there is no limit to how good your life can become. Click on this button to tell your friends about "Dreams Do Come True". My multihull dreams started when I was an intern at Gorgas Hospital in the Panama Canal Zone in 1974. I watched the early multihull designs transit the Panama Canal and head out into the South Pacific. They were homemade cats and tris constructed by their owners who literally built their dreams from the keel up. Most of them spent four or more years creating their dream machine. Those hardy sailors were multihull pioneers. First, they thought their dreams, then they built their dreams with their own two hands, and finally they sailed their dreams. After seeing those early multihulls, I remember telling one of my friends that someday I would sail around the world on a multihull. 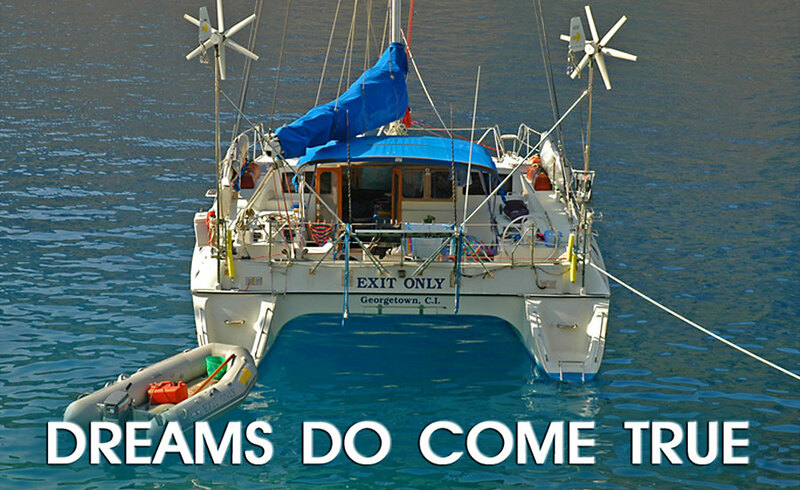 Over the years, I met a lot of naysayers and dream stealers who told me that only a foolish person would sail long voyages offshore on a multihull. On one camping trip in a remote section of Saudi Arabia, I mentioned to a fellow camper that I was sailing around the world on a catamaran when I wasn't working in Riyadh. The camper remarked that I was a very brave person to be sailing offshore on a cat. I asked him why he felt that way. He told me that catamarans were dangerous because they flip over at sea. I wondered how he knew so much about the dangers of offshore sailing, and he informed me that he had sailed in a single-handed race across the Atlantic ocean in a monohull sailboat. Later, he told me that during his attempted solo voyage across the Atlantic, his yacht had been struck by a freighter, and he had to abandon ship because his sailboat sunk in the middle of the Atlantic. It struck me odd that this self proclaimed expert on the dangers of sailing catamarans had his own monohull sink out from underneath him. Although this person had never sailed on a catamaran offshore, he taught me a valuable lesson. I learned that it's unwise to pontificate about things in which you lack experience and have no first-hand knowledge. I do a fair amount of talking about catamaran dreams these days, but I have a right to, because I have sailed around the world on a cat. I'll tell you up front that catamarans not only make excellent offshore yachts, they also are SAFE. They are so safe that I loaded my family on board and took them on an eleven year voyage. They are so safe that we never felt fear at anytime during our entire trip around the world , even during storms. The only person qualified to tell you that you should not sail around the world in a catamaran is another person who has already done it. Anyone else is simply uninformed and is spouting their prejudices about offshore sailing. The corollary to this point is that if you want to live a dream, the only person who is qualified to advise you about your dream is someone who has already done it. Don't listen to the naysayers and dream stealers who live in Nowhere Land and who have done nothing with their life. Instead, talk to the Unstoppable, Consistently Positive, Endlessly Persistent, Doers of Dreams, and take their advice. They know what they are talking about, and if you follow their lead, it won't be long before you are sailing on the ocean of your dreams.